SANTA ROSA, Calif. — Jennafer Carlin Rosset had a bad feeling she wouldn't be returning to her house when her family evacuated their Santa Rosa, California, home in October. 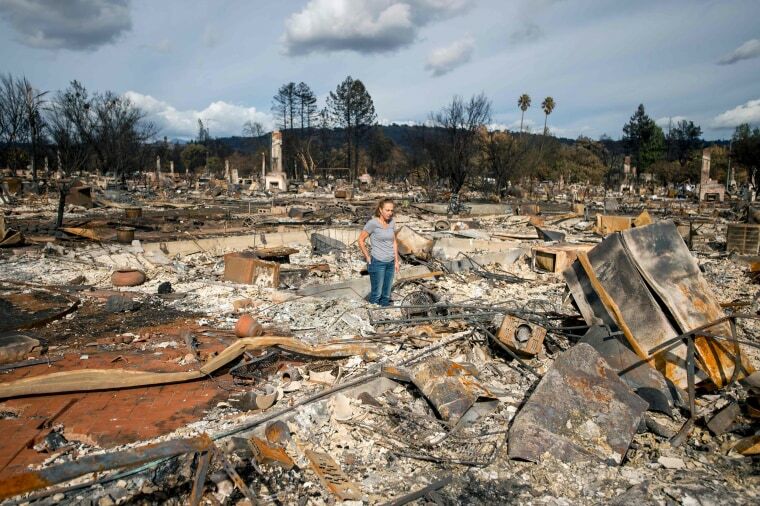 Two months later, fire-ravaged debris still litters many neighborhoods in Northern California, where 44 people died and more than 6,000 homes were destroyed by blazes that devastated much of Sonoma County and elsewhere in the region. Collectively, the fires are among the deadliest in the state’s history. The last single fire to kill as many people was the Cedar Fire in San Diego County during October 2003, which decimated 2,200 homes after being accidentally started by a hunter. But for the survivors like Carlin Rosset, adjusting to the aftermath has been difficult. For starters, she now wakes up her children at 6:30 every morning to drive 35 minutes to and from school. They used to live a short walk away. Carlin Rosset said enduring the traffic is worthwhile so her children can be with their community. Many children have been supportive with each other and recognized that they shared a traumatic experience, said Matt Park, the lead psychologist for Santa Rosa City Schools, where about 25 percent of students have lost their homes to the fires. Park's son is in kindergarten at Hidden Valley Elementary School, where nearly half of his class and a quarter of the students lost their homes. But for parents like Carlin Rosset and Park, trying to make sure their kids' lives return to normal is just one of many tasks to juggle while meeting with insurance adjusters, architects and contractors. For many, rebuilding physical homes is expected to take another year or two. Rebuilding is now a full-time job for June Clark, who lost her home of 38 years. During the first 12 days after the fire ravaged her house, June Clark endured three hospital visits, two ambulance rides and a surgery to trim her vocal chords and a neck polyp. She and her husband, Jamie, have since moved into a temporary rental home, where they plan to stay until their house is rebuilt. While she dreams of escaping the fire’s aftermath in Hawaii — sitting by the pool, with a cocktail in hand — Clark has been confronting her new reality instead, reviewing her home insurance policy and verifying she and Jamie have enough coverage to rebuild. In the meantime, the Clark family said Christmas will be all about family instead of presents. Joe Fryer is a nationally recognized reporter who works for NBC News as a correspondent based in Los Angeles.